1 What is Vestigial Tail? Vestigial is a term that describes organs or tissues that are no longer useful. In human beings, appendix is an example of a vestigial organ that has no function. Vestigial tail is a birth defect that affects the tail bone region4. In the beginning of early embryo development process, every human being has a tail. This tail can be seen between 30 to 35 days of conception by use of ultrasound technology. In many cases, this tail is absorbed into the body to form a tailbone as the spinal cord develops. But in some cases, small amounts of this tissue are left hanging on the tailbone region of the body. These pieces of the tissue may contain no bone but have blood vessels and nerves. In some cases the tail may have bones resulting in either a true human tail or vestigial tail3. 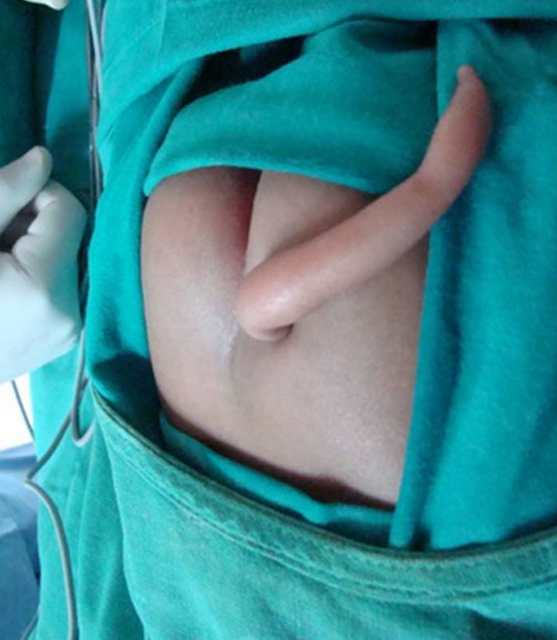 Vestigial tail is associated with defects in embryological development process or spina bifida. Normally, white blood cells are able to degrade bone 6 to 12 during the 8th week of gestation. The 4th and 5th bones are shrunk during the process and eventually the skin encloses the newly formed spine. In case the white blood cells fail to completely absorb the later bones, a tail could be left1, 4. There are no known risk factors of vestigial tail. All babies grow and function well without any association with genetic factors or diseases. The vestigial tail present at birth may end up as coccyx bone. Coccyx is a bone that is triangular in shape and is the last portion of the spine underneath the sacrum. Some studies say that male babies are more likely to be born with a vestigial tail as compared to female babies5. Infants born with this condition usually have a projection at the apex of their buttocks. There is no other symptom of vestigial tail in babies who have it. In many cases, there are no vertebrae in the tail apart from nerves and blood flowing through it1. In case the tail is not removed, it will make it difficult for the baby to sit comfortably. The tail can be about 5 inches or 13cm. Vestigial tail does not cause any undesired complications. In fact babies born with this tail are normal and lead an active and promising life. Less than 50 cases of vestigial tail have been reported from 1884 to date. In some cases, vertebrae may be present in the tail3. Diagnosis of vestigial tail is made through a physical examination. Your doctor will observe the baby after birth to see if there is a protrusion at the top of the buttock. Your doctor may also use ultrasound when the baby is still in the womb to check if the bay has a tail1. Treatment of vestigial tail is by removing it. Your doctor will remove the tail surgically and this process is safe for many patients. You cannot prevent this condition. This condition is not inherited and cannot be passed from a parent to a child1.